I first heard the Birmingham New Wave group Fashiøn while still at my high school. My high school had a radio station and of course I was drawn to that. The station manager for our 10 watt station dutifully wrote to the reps of all of the labels and the only label that responded with actual promos was good ‘ol IRS Records! We got their releases from the dawn of the label in 1979! Among them was the debut album by fashion, “Product Perfect.” I liked that album, and played “Hanoi Annoys Me” from it but the group seemed to vanish into thin air by the next year. Back in that simpler time, you could reasonably expect at least an album a year from an artist. If you didn’t see at least that, something was awry. 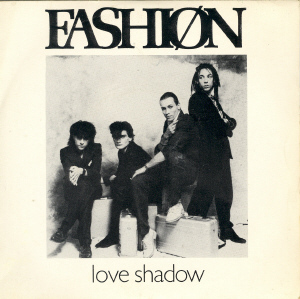 An incredible three years later I saw the long-gestated second Fashion album, “Fabrique.” I saw a video for “Love Shadow” once or twice on MTV in 1982 and noted that the group had dramatically changed its course and lead vocalist, from the look of it. No longer quirky New Wave with a ska chaser, they were now au courant synth funk. Eventually, I got their album and was rewarded with a stellar program of peak whitefunk as devastatingly produced by hero Zeus B. Held. I waited years to finally get the “Fabrique” album on CD. I missed the 1990 first pressing but got the Cherry Red repressing of it. It managed to fit most of the double play cassette version of “Fabrique” onto a single CD. But by the 90s the hooks of this album ripped deep into me. I embarked upon a program of purchasing all singles from this album period, since singer De Harris was gone from the third and final Fashiøn album. I have the third album on LP, “Twilight Of Idols” and I haven’t gotten around to listening to it yet. My suspicion is that it was De Harris’s songs that hit me in the right spot, though the playing and production on “Fabrique” was also working like a fiend for me. The whole effect is rather like a 4/4 version of “Tin Drum” by JAPAN where the group was slumming in funk instead of YMO’s secret laboratory. By about a decade ago, I finally had all of the singles from “Fabrique” in both their 7″ and 12″ forms. I even managed to find a DISCONET EP with a megamix from “Fabrique” on it at a Goodwill somewhere! Just now, I’ve looked at their stronger competitor and discovered that there was a Razormaid mix of “Streetplayer Mechanik” so I will try my utmost to obtain this, though RM product is notoriously costly. I feel that I’ve sat on these records for too long now and after I finish up my ABC project described earlier, I will be moving onto Fashiøn. Just what will that entail? I need to listen to both sides of this when I record the vinyl to hard drive. I need to see if the 7″ A-side differs from the LP mix. The “Height Of Fashiøn” CD I have is “Fabrique” in all but name, and it contains a tracks called “Mutant Move” so I need to A/B compare the two. I do not have the 12″ of this single for reasons that will be made clear later. This 2×12″ was the first Fashiøn record I’d bought and it has the “Move On” 12″ single added to the package. Additionally, I have Disconet Volume 5 program 5, with the “Fashionable Dubs” megamix, but I still need Razormaid Class-X 4 for their “Streetplayer – Mechanik” DJ mix. More on this later, I’m sure. This entry was posted in Remastering and tagged De Harris, Fabrique, Fashion, Zeus B. Held. Bookmark the permalink. Mutant Dance Move is my favorite music from Fashion. It could go on another 5 minutes and I would enjoy every moment. Overall, Fashion never quite convinced me. Maybe I couldn’t reconcile their look with their sound – which is certainly my issue, not theirs. Fabrique is by far their best attempt at capturing my attention. Love Shadow and Slow Blue are the most interesting tracks on the album for me. Listening to them now, I can fit them in quite easily with Japan (their more playful moments), Visage, Spandau Ballet (their less bombastic moments) and Duran Duran (their more accomplished moments). So maybe Fashion and Zeus B. Held were on to something that I just wasn’t paying enough attention to at the time. Echorich – This album is the bomb for me, personally speaking.Quite frankly, nothing else quite hits me like this album! This is decadent techno-funk just made for cruising the slick, night streets of Berlin at 4:00 AM in your DeLorean. If cocaine were music, this album would be the result. The band declared that this album was designed as accompaniment for “screwing and taking drugs” and I wouldn’t dispute that. The slink factor here is off the map. 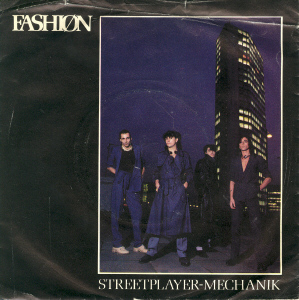 I have to dig out my copy of Height of Fashion again an really take a listen to it. I’m sure that I’m more open to it now than I was then. In ’82, I was ingesting music from all over. My electronic passions were giving way to harder, post punk and the burgeoning Positive Punk/Goth scene. But as I was beginning to be entranced by certain bands, my focus began to narrow and rather than expanding in scope my purchases began to constrict around those bands that I was most fascinated in and other artists who complimented them. As the turning point year of 1983 came and the post punk era was beginning to give way to a new era of record company pop and rock, I certainly settled into those artists that I consistently enjoyed. I don’t think I was as adventurous again until the end of the decade and the House/Balearic/Shoegaze era caught my attention. I’m simplifying things here quite a bit, but I know there was a lot of music which I dismissed or didn’t investigate fully which I now have time to stop and listen to. Man, apart from the (singer?) these are some SERIOUSLY ugly dudes, and not even 80’s HAIR™ can hide it! Once again, Zeus B. Held saves the day! chas_m – Prize comment of the day! I too love Fabrique and have the remastered Twilight Of Idols. Fabrique is one of those great cult albums of the 80s that certainly deserves to be reissued properly. I’ve emailed Cherry Red numerous times as have others enquiring about the possibility , and all they say is that it’s an interesting prospect. Actually there’s an excellent vinyl rip mp3/FLAC on djPault’s burningtheground blog of Love Shadow (Smokey Dialogue). 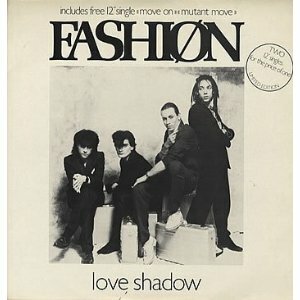 What i’d like is a remastered 7″ mix of Love Shadow. 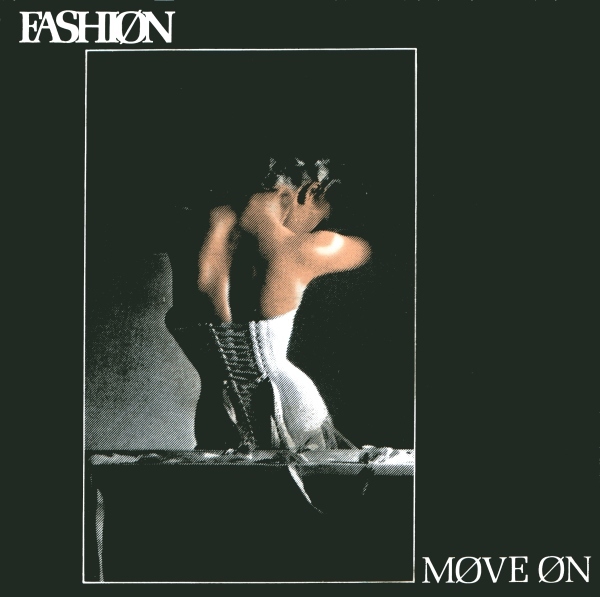 BTW Move On (Audio Extra) is featured on the new 12″/80s New Wave Collection. Check it out! I discovered your blog via a search for Fashiøn. Nice work. Dave Harris and Zeus B. Held are currently working on a remastered, deluxe edition of “Fabrique”, however it probably won’t be available until next year. I have been involved in the instigation of this project and will be providing liner notes, which will be taken from a forthcoming book I am writing on the making of the “Fabrique” album. I was wondering if you have an MP3 of the Disconet “Fabrique” megamix or are planning on uploading it to YouTube? Did you manage to find a copy of the Razormaid remix of “Streetplayer-Mechanik” by any chance? I had not heard of either of these releases. I’d be keen to know if you’ve managed to glean any other Fashiøn “Fabrique”-era memorabilia that might be of interest. brynstar – Welcome to the comments! If you are writing a book on the making of “Fabrique,” then you already have one guaranteed sale. Please keep us updated on that. I hope that any Fabrique” DLX RM will have all that it should contain as the 7″ and 12″ mixes were all important. I don’t have an MP3 of the Disconet megamix; I have the record itself. Since you’re new here, I’ll mention that I don’t upload upload anything. I don’t give away music that’s not mine to give. And I don’t use any Google services, so I don’t have a YouTube channel. I am seriously old school in this regard. I still don’t have the “Streetplayer-Mechanik” Razormaid mix yet. It eludes my reach. Also, I still need to get the Dee Harris version of “Love Shadow;” a record I only discovered in recent years. That one fascinates me. Were you aware that Discogs lists the uncredited femmvox as being attributed to Brenda Bennett… of Vanity 6 infamy? That’s fair nuff re: no uploading. I will need to dig deeper. Are you able to describe the megamix? What songs are included? How different is it to the official released remixes? Do they use much vocal, or more dub mixes? Yes, Dave is friends with Brenda Bennett, the same Brenda ex-Vanity 6. I actually don’t yet own any of the Fashiøn 7″s, only the 12″s. Do the 7″ mixes actually differ from the album versions? They appear to be the same running length, so I assumed they were the same mixes, and I’ve not read of any mention of them differing. I know the 7” of Love Shadow is different from the album version. Different drum programming, I think. Omar – I primarily bought the 7″ singles for the B-side edits, which were usually different from the 12″ mixes, but I’d be shocked if the A-side were not altered in some way for release. I’ll have to listen and comment later. brynstar – I’ll have to play it tonight and report back with my findings. I suspect that it’s got a new rhythm track fabricated that flows through the whole megamix, with the dub 12″ mixes used for that. Ah, the megamix; Was there a sadder, more instantly dated 80s phenomenon? The 7” also has a different intro. This is intriguing. I will definitely have to get to the bottom of it. You can see the video on YouTube. They use the 7” mix for that. I unfortunately don’t have the 7” mix of Love Shadow. That’s cool. I’ve tried searching on YT for a radio version of “Love Shadow” that sounds different to the album mix, but to no avail. Apart from the 3:40 (approx.) mix – the album version, there are only the two 12″ extended versions; the “Smokey Dialogue” mix, and the rare US promo mix. Isn’t the promo mix the same as the 7”? The US promo mix that I have is on 12″, yes, with the medley of truncated dub mixes on the b-side. I have never heard the 7″ of “Love Shadow”, so perhaps it is an edited version of the US promo mix …? You’d think someone might have uploaded that version by now, on YT. I assumed the 7″ mix was exactly the same as the album version. Brynstar – This rare US promo mix, is it a 12″ or 7″ you speak of. I have the US promo 12″ with the medley on the B-side. I do not have a USP 7″. I need to find the time to play and record all versions of “Love Shadow” that I have and report back with my findings, but I said that 6 months ago, as I recall! Hi Omar, I finally found the link you messaged me from last year! Thank you! Apologies I didn’t see it earlier, but Facebook algorithm means anyone not directly connected to you has their messages shunted into a filtered inbox. Indeed, the video promo mix is different to the album version, it uses an intro only found on the rare, unreleased dub version! brynstar – As I recently listened to all of the 7″ singles I can say that “Love Shadow” is definitely a unique mix. I believe that one other single differs, but I’m not sure which one it might be. I’ll try to listen again tonight and report back with my findings. That would be great, cheers. I need to acquire all the different mixes, I’ve been too slack. Make that TWO guaranteed sales! 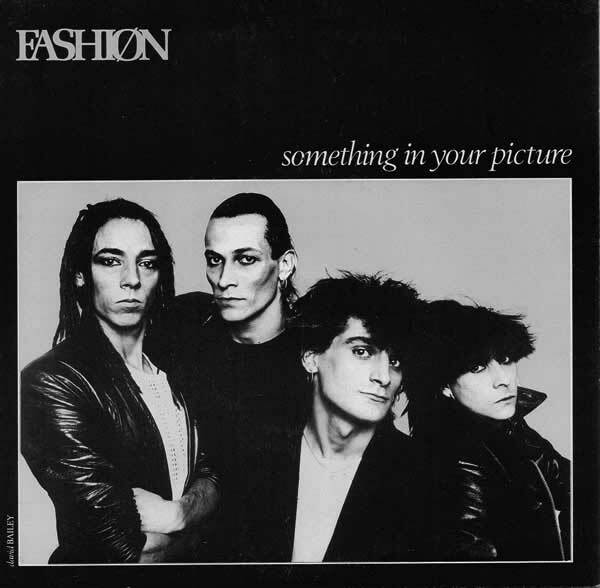 By the way,I too discovered PPMs superb and essential blog through a Fashion discogs entry! Gavin – Memo to self: leave more reviews on Discogs release pages! Seriously, I know what it’s like to seek out other fans of a personal cult favorite. Sometimes you listen to what is typically an unsung record and wonder if you were the only person who “got” it. Then you search for kindred souls. There used to be a Fashion tribute page made by Bob Edwards who it says was their road manager. Its still there but the Fashion live bootlegs are gone and its just the Troy Tate albums that are there now. Glad i got the Fashion live in 82 bootlegs because they are excellent. Jamie Bell – Welcome to the comments! Fascinating! I had not heard of that. I have combed the web for data on Fashi﻿﻿øn ever since there was a web, but I never chanced upon that one. Lucky you on the boot front. Usually, I ignore bootlegs, but that’s primarily because bootleggers only hit the biggest targets, which are of no interest to me. I got so depressed going to record shows that were nothing but Springsteen/KISS®/U2 bootlegs in the 90s! Hi Jamie, yeah, I was lucky to stumble across Bob Edwards page when it still had the Fashiøn live gigs – Edinburgh and Sheffield – embedded. Both sounded great, as they were taken from the mixing desk. Sorry i didn’t realize uploading was banned on here. Please accept my apology. 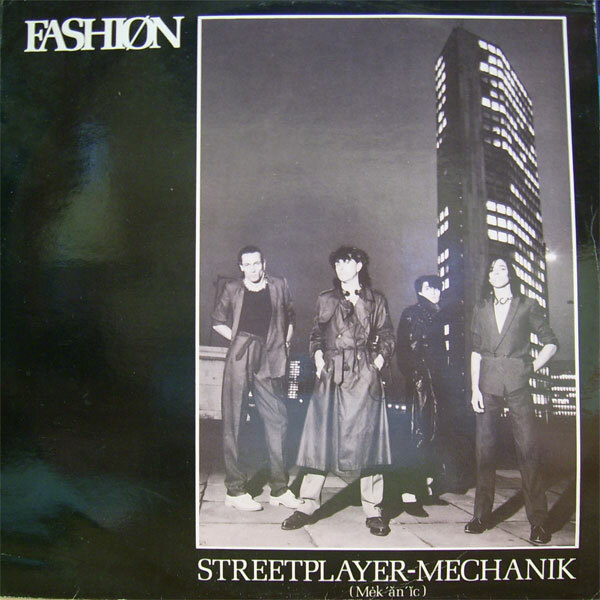 I downloaded Fashion – Streetplayer Mechanik (Razormaid! Remix) from a private torrent site a good while back. It was 264kbps though. Don’t know why he didn’t upload in FLAC or even 320. The full torrent was about 80GB if i remember rightly. Probably why he didn’t upload it all in FLAC now i think of it. Jamie Bell – Technically, yes. I don’t want DLs on this site unless the artist is spreading it around themselves. I have problems with Google and would never host youtube videos here in a post, but if commenters want to embed youtube clips, I don’t want to be too much of a killjoy so I always approve those comments. Of course any comments after your first one without any links are white listed! Didn’t know there was a Disconet mix. Must search it out. Jamie Bell – I still need the Razormaid mix. I’m itching for it right now and it’s currently thin on the ground at Discogs. That and the USP 7″ and so think I’m set. Or i can upload it here and you can delete it after download.? Jamie Bell – Thanks, but no. I have a thing about buying records I want. Totally (compulsively) old school. Understood, i still spend a fortune on vinyl and my turntable broke a couple of years ago. I dread to think how much i spend on music. Last one was on Friday for an SPK live album called Paradiso from Discogs.15euros. Its cheap enough until the postage gets added on. Good luck in your search then bud. Jamie Bell – Postage? Don’t talk to me about postage! These days, the records I want cost $5 but the postage [from foreign lands] is $20! A complete inversion of 10-15 years ago! Music is worth almost nothing but the postal services are getting all of the wealth.